This unveiling is part of a transition in production philosophies. The new philosophy is to align production to unlock as much opportunity as possible with current Cryptiquest brands. With this philosophy in mind, efforts have been diverted fully into the CQ StoryHammer game system project, which is targeted to launch a beta release by the end of the year (2018). 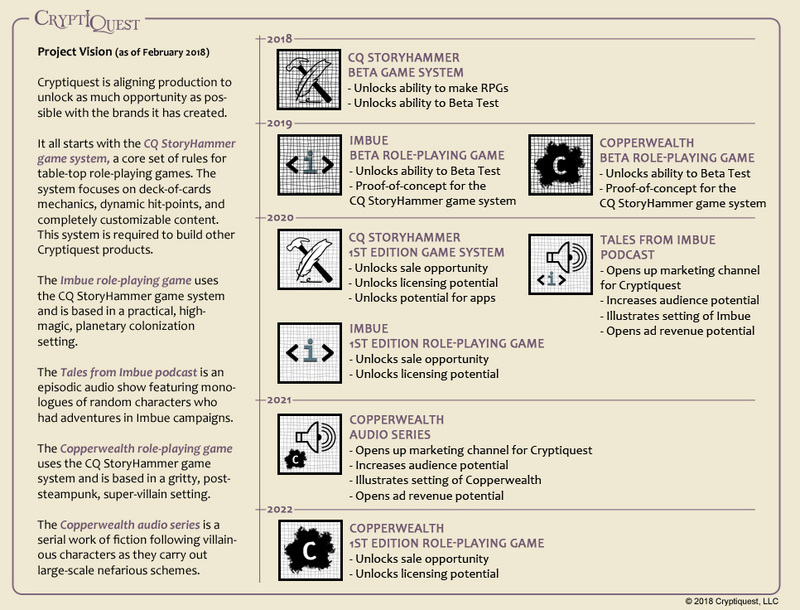 A finished CQ StoryHammer game system will “unlock” Cryptiquest’s ability to make games with the system. And those games will unlock further opportunities, including media ventures (such as the Copperwealth audio series). Each completed project serves to unlock further capabilities and complement or promote the CQ StoryHammer brand. A release schedule, highlighting the projects (and the capabilities they unlock), is the main component of the Road Map. It is scheduled for five years out (2018 through 2022). This plan may evolve over the years but Cryptiquest is confident that this is the best path forward.